Auto wash and paintwork cleanser in one! Chemical Guys Citrus Wash in the red formula is a highly concentrated, high performance total auto wash capable of removing heavy dirt buildup from auto finishes. Made with natural citrus extracts, Chemical Guys Citrus Wash is biodegradable and surface friendly, yet it is tough on grime. Use it to give your vehicle a deep-cleaning wash before applying a fresh coat of wax or sealant. Chemical Guys Citrus Wash contains concentrated citrus extracts that break down dirt and grime and hold soil in suspension for scratch-free rinsing. Dirt rinses off safely. This is an excellent surface prep car wash. It is formulated to thoroughly clean dirty paint in preparation for polishing and/or waxing. Chemical Guys Citrus Wash rinses clean and leaves a streak-free finish. It contains no artificial thickeners, colors, or additives and it is 100% biodegradable. Use Chemical Guys Citrus Wash to get the dirtiest vehicle completely clean. Mix 1 capful with 5 gallons of water for regular washing. For heavy build-up, mix 1 oz. with 1 gallon of water. Rinse vehicle to remove loose grime. Wash from the top down and rinse vehicle frequently. Use a final rinse of free-flowing water to allow water to sheet off. Works way better than I thought. I had got this just to give their stuff a try because I heard good things and now I know why. I have never had a car wash that you use so little and it gives you so much. I was in a hurry and just wanted to wash my car so I didn't dry it off or really have a nice wash mitt to use at the moment either. It was about 95 degrees out and sunny with my black car and I always have water spots even if I dry it because of my hard water. I did a basic wash and just let it sit until I left later and I noticed that I had basically no water spots at all and it did a great job at cleaning the car as well, I was amazed. I forsee me getting a whole bunch more of their products in the near future if this is the quality of products they have. First chemical guys product I've tried... and certainly the first of many. Used the citrus wash at 1oz/gal concentration to strip off a cleaner wax applied 5 days earlier in order to finish polishing and apply a coating. Thus, wash induced scratches were my #1 enemy. Did a fantastic job! A 1/2 panel water beading test on the hood confirmed that the cleaner wax was either completely or mostly removed. At that concentration, the lubricity was insane. So, with a new mit, grit guards, and the citrus wash, I did not notice any obvious additional scratching. Mission accomplished! Cool fact:: they add a sweet orange fluorescent dye to the product! Really glows in the sunlight. Not sure if this is for functional or aesthetic reasons... but it does start to tone down once the product reaches the recommended normal 1oz/5gal dilution level, so perhaps that's the idea? Would love to hear about this in the product description! 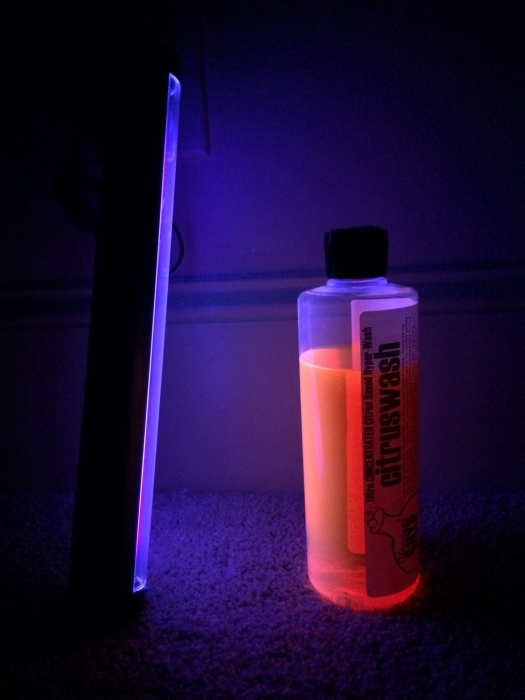 Pros+Awesome finish stripping performance +Great lubricity +IT GLOWS! +Smells pleasant +Biodegradable, and apparently very safe for all automotive materials. Cons-Uses a good bit of the bottle for stripping one car at 1oz/gal. However, the bulk (gallon) size makes the product much more affordable. Will buy this next time. Ive moved on to a rinseless wash, but three times a year I do a conventional wash with this. It works. You can mix it strong enough to take out the hardest sealants. When you absolutely, positively have to have it as clean as you can, this is the go-to product. ProsThe standard of the industry by now. Got this along with Maxi-Suds. The idea was that this would be for the heavy-duty wash, Maxi-suds for in-between. Strong stuff! Gets the crud off. Don't use dish soap, use this. Worth the trouble of mail order. Maxi-suds is also an excellent product, but not that much different than premium shampoo you can get at auto parts store.